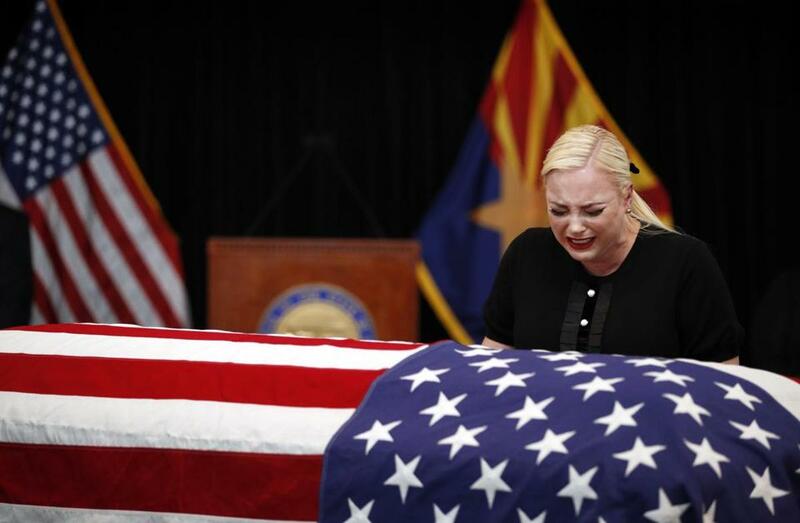 Meghan McCain, daughter of Senator John McCain, cried at his casket during a memorial service at the Arizona Capitol on Wednesday, Aug. 29, 2018. In tweets on Saturday and Sunday, Trump attacked McCain — who died in August 2018 after battling brain cancer — over his role in the Russia investigation, and disparaged the senator for his decisive thumbs-down vote that doomed efforts to repeal the Affordable Care Act. He also mocked McCain’s academic record (the senator, himself, never shied from noting that he graduated fifth from the bottom at the Naval Academy). Spreading the fake and totally discredited Dossier ?is unfortunately a very dark stain against John McCain.? Ken Starr, Former Independent Counsel. He had far worse ?stains? than this, including thumbs down on repeal and replace after years of campaigning to repeal and replace! So it was indeed (just proven in court papers) ?last in his class? (Annapolis) John McCain that sent the Fake Dossier to the FBI and Media hoping to have it printed BEFORE the Election. He & the Dems, working together, failed (as usual). Even the Fake News refused this garbage! Many people tweeted in support of the McCains. Trump, however, responded by retweeting one of his supporters, who hit back at Meghan. Meghan MCCain took a swipe at Trump suggesting ?no one will ever love you like they loved my father? WRONG Meghan! Millions of Americans truly LOVE President Trump, not McCain. I?m one! McCain, who is also a co-host on ABC’s “The View,” elaborated on her tweet during the show on Monday. McCain said her father spent his free time with his family — “cooking, hiking, fishing, really celebrating life” — which led her to think more about Trump. The bad blood between Trump and McCain goes back to when Trump was campaigning in 2015, in which he said McCain was a war hero “because he was captured. I like people who weren’t captured.” The feud seemed to escalate from there, as McCain withdrew his endorsement of Trump following the ‘‘Access Hollywood’’ tape, and then cast a “no” vote on the Affordable Care Act repeal measure. In August, as McCain battled brain cancer, Trump signed a $716 billion defense policy bill named for the Arizona Republican — but included no mention of him in his remarks. Before he died, McCain made it clear that Trump was not welcome at his memorial service in Washington, even as both President Barack Obama, who defeated McCain in the 2008 presidential race, and President George W. Bush, who defeated him in the Republican primaries in 2000, delivered eulogies.